Died: November 27, 1936 in Bourne Ma. at 74 yrs, 5 mos, 27 d.
To: Annie (Simpson) Ogilvie; (1865 – 1953) (George Simpson & Eliza Morrison); Annie married (1) (–) Ogilvie. 1. Lillian Annie Mutch Chauvey, twin; (November 22, 1897 – 1934); Married (–) Chauvey; Lillian is buried in Pocasset Cemetery with her parents & twin brother & his wife Lillian G..
2. Harold Alexander Mutch, twin; (November 22, 1897 – 1958); Married Lillian Galvin (1901 – 1979) in Lowell Ma. 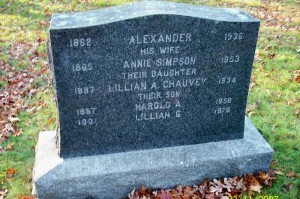 in 1923; Harold & Lillian G. are buried in Pocasset Cemetery with Harold’s parents & twin sister Lillian A. Chauvey.